Mugabe was booed by MDC MPs and his SONA has generally been dismissed as hopeless. 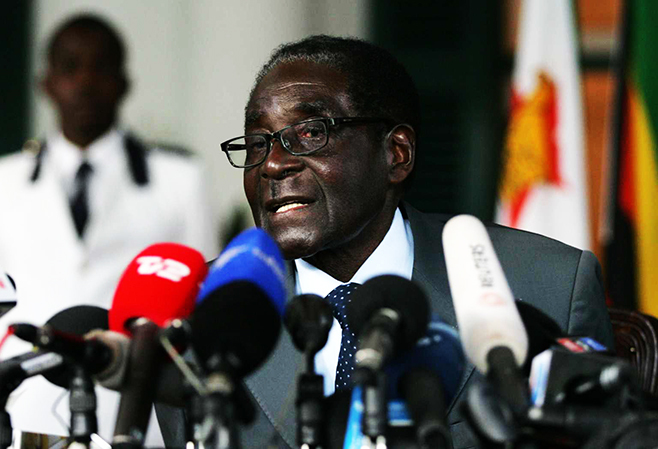 ZIMBABWE – President Mugabe is expected to officially open the Third Session of the Eighth Parliament on September 15, 2015 following the end of the Second Session last week. The Second Session of the Eighth Parliament ended on August 25 with Mugabe delivering his State of the Nation Address. In an interview yesterday, Clerk of Parliament, Mr Kennedy Chokuda confirmed the development. “His Excellence, the President will address both Houses at the occasion of official opening. The speech will give the legislative agenda for Parliament to be followed for the coming Session. We expect the dates to be published in the Government Gazette soon,” said Mr Chokuda. Senate president Cde Edna Madzongwe notified the Upper House of the end of the Second Session of the Eighth Parliament soon after President Mugabe addressed a joint sitting of both Houses. She said this while urging senators to wind up their motions as they would be superseded by the prorogation of the Session. “Ordinarily, we should adjourn the Senate after the State of Nation Address, but when we come back, (after adjournment) we are coming for the official opening of a new Session. So, I would like to give a chance to those who have motions on this Order Paper to withdraw their motions so that we keep with our Standing Rules and Orders. “People debated and they were quite concerned about some of these motions. We cannot just let them fall away. So, if movers are here, it would be good if you can move for the removal of your motion from the Order Paper or for their adoption,” said Cde Madzongwe. One of the major highlights of the Second Session was the passage of the Labour Amendment Act, which sought to put a stop to the haemorrhaging of the labour market. This followed a Supreme Court judgment on July 17, which allowed employers to terminate employment contracts for workers by giving them three-months’ notice in terms of common law. This saw employers laying off workers, a situation that resulted in more than 20 000 people losing their jobs.